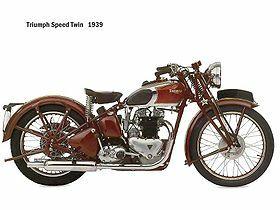 The Triumph Speed Twin was a 490cc, 4-stroke, street motorcycle manufactured by Triumph from 1937 through 1958. Edward Turner's revolutionary vertical twin only had a brief production period in the late 1930's when WWII intervened. 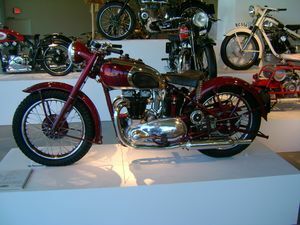 Post-war, the Speed Twin re-appeared in similar form with the Addition of telescopic forks replacing the old style girders. Maroon Speed Twins were used by the majority of police forces in Britain and were popular for their speed and flexibility. 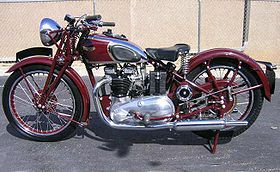 The Speed Twin was the basis for all Triumph twins until the 1980s. Its four-speed transmission was a simple design that would be used in several Triumph models over the years. This page was last edited on 10 August 2010, at 17:34.